Melanoma is the most dangerous type of skin cancer. It is the leading cause of death from skin disease. Currently it is the sixth most common cancer in both males and females. What is the cause and incidence of melanoma? This entry was posted in Cancer and tagged Acral lentiginous melanoma, lentigo maligna melanoma, melanoma, melanoma causes, melanoma maligno, melanoma moles, melanoma skin cancer, melanoma types, multiple melanoma, pictures of melanoma, skin cancer, skin melanoma, what causes melanoma, what is melanoma on May 17, 2012 by Dr.Sobia Adnan. 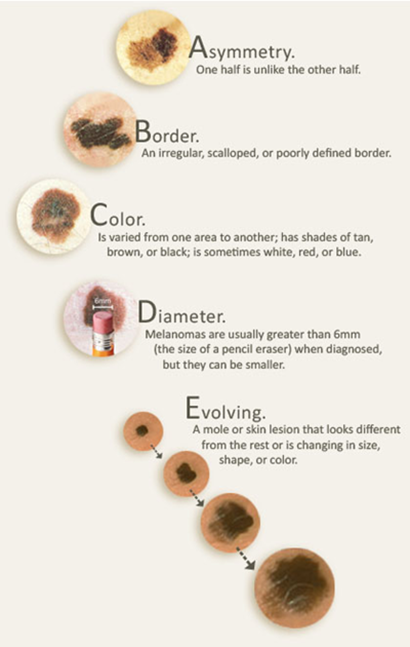 A mole, sore, lump, or growth on the skin can be a sign of melanoma or other skin cancer. A sore or growth that bleeds, or changes in skin coloring may also be a sign of skin cancer. Diameter: The spot is usually (but not always) larger than 6 mm in diameter. This entry was posted in Cancer and tagged melanoma, melanoma cancer, melanoma images, melanoma moles, melanoma signs, melanoma skin cancer, melanoma symptoms, pictures of melanoma, skin melanoma, tests for melamona, what is melanoma on May 12, 2012 by Dr.Sobia Adnan.